Traktor Pro 2 is here! The eagerly awaited Traktor Pro 2 from Native Instruments has arrived in stores and is also available for download. I downloaded the demo version yesterday and had a quick play around with it. The aim was to check out the main differences and to communicate them to you. So the install process is first of all very simple. It allows you to copy all your previous settings and information across into Traktor 2. The only thing that appears to be missing so far is my X1 settings, but this will be straight forward to do inside the preferences. It also appears that all tracks need to be analysed again, which imports all their cue points and grids. TP2 then works through a set up wizard, allowing you to set up the system how you like it. Don’t worry too much about this though, as if you make any mistake you can change it within the preferences later down the road. Apart from the initial obvious GUI changes (it looks nice and is all different colours). 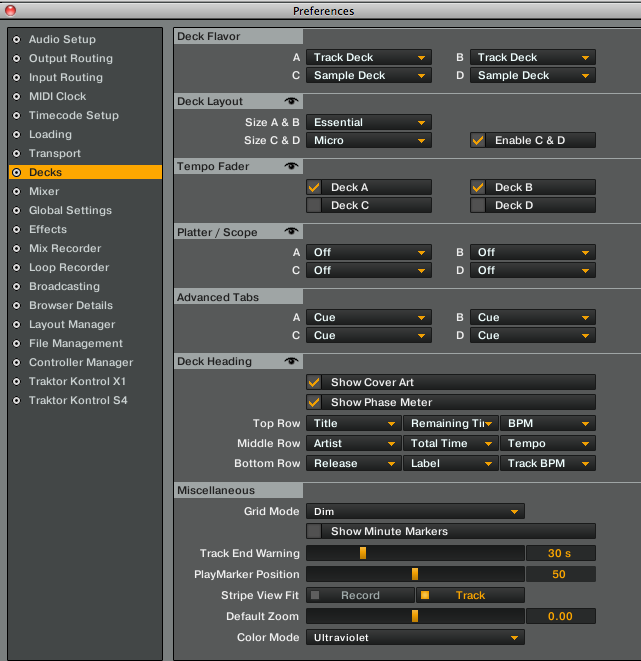 The other main difference is the option of changing the deck type to either ‘Track’, ‘Sample’ or ‘Live’. The ‘Live’ option being very similar to the ‘Audio Through’ setting of TP1. With the added option of using sample decks. This is completely customizable and you can set any deck up as any type of deck. Another cool change is the beat tick addition to each deck. They have removed it from the top and placed this tick function in each deck. Although at this stage, it is a very quiet tick and apart from turning the gain on the track way down and panning the track either left or right to hear the tick in the channel with no audio, I am yet to discover a way to control the level between music and tick whilst monitoring in the headphones. There appears to be no mix level for the headphones on the internal mixer?! [Edit – thanks to a friend – it appears that you must have the crossfader set to on if you want to see the headphone cue knobs!!] The other option may be to use the master tick on the master clock, which plays through the monitor channel and then play the track through the main output to align the beats. Deck Preferences, show a bunch of different options (click the picture to enlarge). The two things I wanted to mention were the Deck Layout and Platter/Scope. The deck layout has a couple of different options, one thing I discovered is that if you like to toggle between showing the advanced panel under the deck, then the only way this is possible, is if you have the layout set to ‘Advanced’ in the preferences. One thing I noticed, which may be something Native Instruments may want to change down the line, is that if you have either of the 2 lower decks (C or D) set to be a sample deck in the ‘Deck Flavour”, then you are only able to set both decks C & D to small or micro. I think it may be nice to have 3 full decks whilst running just one sample deck. The platter / scope section is pretty cool. It enables you to change what is displayed on the deck, in relation to time code set up and signal. It basically either displays a) the signal flow in concentric circles (each circle representing left and right audio) along with the vertical signal bar, b) the deck with the spinning yellow bar to indicate movement of the spinning deck, or c) just simply the vertical signal bar. I think this is a great addition as sometimes you can forget to calibrate when you plug into a new system and the little vertical bar being there; might just jog your memory. There’s a whole bunch of different things that have changed and some nice little additions to the preferences, I don’t want to go into them all here in-depth, but I will give them a quick mention. 2. The useful ‘info’ button that displays hints as you hover over a function has moved to a check box labelled ‘Show Tooltips’ inside the Global Preferences. 4. The loop recorder has settings for latency & all loops created are filed away in a new system folder as wave files. Excellent for exporting to other production software. 5. You can disable inline editing in list window – this prevents those occasional annoyances when you accidentally change a tracks details in the browser, whilst frantically searching for a track. 7. Wave zoom can be micro adjusted to your own preference. 8. And finally, although I haven’t had a chance to play with the function yet – “Sync Phase when exiting loops” – could be an interesting tool. So there you have it – a brief overview of some of the changes / additions to TP2. I did not go in to the playability or the actual functioning of the sample decks in this article as I wanted to allow myself more time to experiment. But on initial inspection this version of Traktor will certainly lead to more creative live DJ sets and opens up the floor to way more possibilities. I like it Native Instruments, good job. Feel free to add any of your own comments or observations below.